Mmm that vanilla shake looks lovely and creamy - don't you think it's funny how my eye automatically goes to the delicious looking items. I think it says a lot about me lol. Is that a motorbike you boy is sitting on? That whipped cream looks so good! And so do those cookies! your boys are so cute! that shake looks so good! The whipped cream caught my eye, and I have such a thing for snowmen, too cute! I love your collage this week. Great snapshots! Those cookies look yummy, as does the shake. Thanks for stopping by. Have great day! Great Photos Deb, I just want to know one thing. . .how the heck did you get your boys to keep a journal??? I have tried for years BUT! They just won't do it. I gave up! I would love to know where you made that photo collage, what program is it? Lovely shots. Alec has a great smile. Such awesome shots. Love them all. That shake looks yummy! Where did you get it? I LOVE bass pro shop! I desperately want to do a P365 this year. I really like how you do your weeks as collages. love those shots, my fave is that one of your boys. Week 49! EEEEEKKK.. Time flies when your having fun. 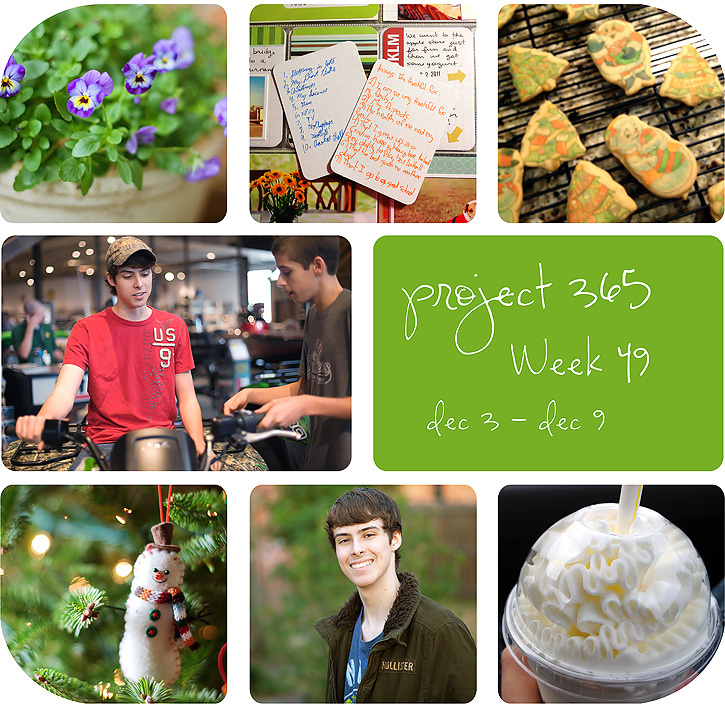 I've had such a blast documenting the whole year using Project Life & am looking forward to 2012. Love your collages and have a question is that template you created or is it something you purchased? I'd love to be able to incorporate something like that into my album next yr. Especially JUST at the beginning of the year as my little girl's bday is on the 3rd of Jan. & its going to be the Big "5" Ha.. So I know I will have a zillion pics. Thanks so much!